As I head down the coast for a summer break, these are the books about Central Asia that I've packed. First up is a charming French book En Route pour Samarcande, published by Fleurs de Lettres, Paris. When this book arrived I flipped through it - now I wish to savour the paintings and text. 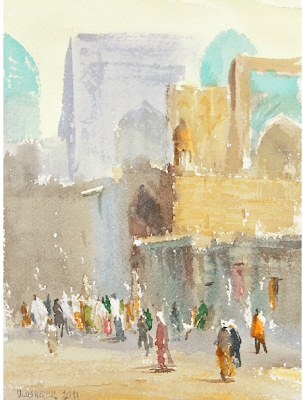 Uzbek water colourist Ulughkbek Mukhamedov takes the reader on a journey through the magical Silk Road cities of Samarkand, Bukhara and Khiva. Each painting is accompanied by excerpts from early European travellers, e.g. Arminius Vámbéry, Alexander Burnes, who visited those places. It is a beautiful, hand-stitched edition on fine-quality paper (Rives Vergé). If you have already visited Uzbekistan, this is an evocative memory of your visit. (The book is a very reasonable Euro 25 and the shipping cost a bargain at Euro 2.90. The editor speaks English, so if you are uncertain about ordering in French, just use the website's contact form). A visit to Ulughkbek Mukhamedov's home studio is now included in Uzbek Journeys tours. 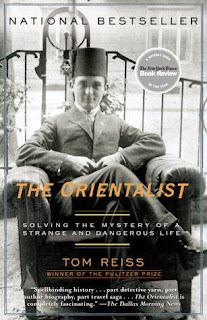 Tom Reiss' The Orientalist: Solving the Mystery of a Strange and Dangerous Life has been in my *must-read* list for some time. Published to rave reviews, this is a biography about the remarkable life of Lev Nussimbaum, author of one of my favourite novels set in Central Asia: Ali and Nino. Written under the name of Kurbin Said and set in cosmopolitan Azerbaijan at the turn of the 20th century, Ali and Nino is ostensibly a love story about a Muslim boy and a Christian. However, it is really the author's homage to a vanished way of life in Baku. Earlier this year in Kyrgyzstan I picked up a copy of Atlas of Central Asian Artistic Crafts and Trade, Volume III - Kyrgyzstan. (I bought it at the bookshop in the yurt at Burana Tower). It is a comprehensive review, in English, of ancient and modern Kyrgyz craft, with a special emphasis on yurts and yurt decorations. The more time I spend in Kyrgyztsan, the more I value the rich heritage of nomadic craft. The Return of a King: The Battle for Afghanistan 1839 - 1842 is William Dalrymple's history of Britain's great imperial disaster often referred to as the First Afghan War. I like Dalrymple's style: he is perceptive, thorough and readable. He has drawn on extensive materials from Russian, Urdu and Persian archives as well as previously untranslated Afghan accounts, including the autobiography of the king himself - Shah Shuja. If it is like Dalrymple's other books on India, this will be "un-put-downable". Ella Maillart was a trailblazing Swiss adventurer who, in 1932, travelled through Soviet Central Asia. 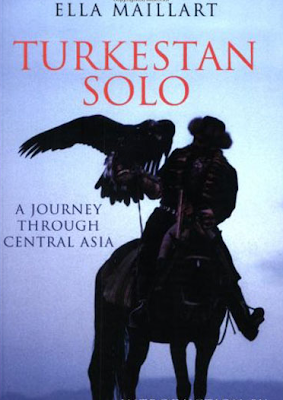 Turkestan Solo recounts how she crossed Kyrgyzstan on horseback as far as the Tian Shan range (the Celestial Mountains ) then, with makeshift skis, she climbed a 5000 metre mountain on the Chinese border. She explored Tashkent, Samarkand and Bukhara and travelled along the Amu Darya (Oxus river). Later, by camel, she crossed the Kyzyl Kum desert (Red Sand) solo to the east of the Aral Sea. Readers who have visited Bukhara's Silk Road Teahouse and Spice Shop may be interested to know that the owner's grandfather met Ms Maillart in Bukhara and she was a guest at his home there. I wish to re-read Chingiz Aitmatov's brilliant novel, The Day Lasts More than a Hundred Years. Set in the the Central Asian steppe during the era of the Soviet space race, it movingly recounts the journey of Yedigei, a Kazakh railway worker, to bury his lifelong friend according to traditional Muslim rituals. Finally, I have thrown in Miniatures of Central Asia, which I picked up for US$1 at the second-hand booksellers area in Tashkent's Golubie Kupola Park. Written by the noted art historian and scientist Galina Pugachenkova, I am hoping this slim volume will increase my knowledge of this exquisite form. It has been a great pleasure for me to meet and travel with Uzbek Journeys clients. To those clients and indeed all readers of this website, I wish you a marvellous 2014. I hope it includes travel to interesting places, meetings with kind, hospitable people and moments when you can sip a cup of green tea and reflect on how grand life can be.